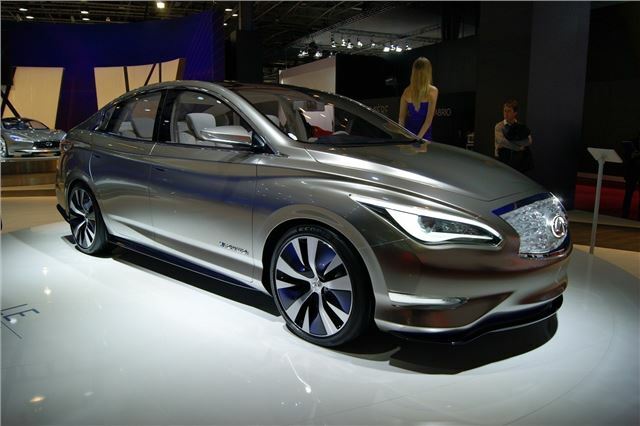 Infiniti has shown its new all-electric concept car at the Paris Motor Show - the LE. Although it's technically a concept it's set to go into production pretty much unchanged within the next two years and it's very likely to be sold here in the UK. The LE was first shown at the New York Auto show in April this year but this is the first time it has been shown in Europe. It's similar in size to the Infiniti G saloon but unlike its petrol-only counterpart, the LE is powered purely by an electric motor. The 100kW (134PS) unit has 325Nm torque with a range of around 100 miles with Infiniti promising 'impressive EV acceleration without sacrificing range'. Thanks to a quick charger it can be charged to 80% of capacity in just 30 minutes plus Infiniti is looking at the possibility of a home-based wirless charging system, something which would revolutionise electric cars. This uses a coil encased in the charging pad to charge the battery via inductive energy flow. The Intelligent Park Assist feature will automatically align the vehicle over the charging pad for optimum charging and the driver can walk away, with no cables to connect. The high-frequency, non-contact charging, controlled by the car’s display or by smartphone, is safe for children and pets and can be installed easily in a home garage. Inside the LE, Infiniti is aiming for a luxury feel with top class refinement. There's a sculpted gear shift that controls the drive system and offers several driving modes, while a centre cluster shows information such as a dynamic range calculator, using a mix of digital and analogue displays. The lithium-ion batteries are situated under the floor so there's no compromise in boot space plus it should helps the handling, creating a low centre of gravity. The aerodynamic shape includes a front spoiler, rear diffuser and side aero fins which all glow with integrated illumination.